Hi and welcome to The Afternoon Debate. After a long morning at your desk, sometimes you need a break, a cup of tea and something quick to read that may spark a lively conversation in the office. Each post is intended as a platform for you to launch your own afternoon debate. Please join the conversation. I love being a lone freelancer. Working from home, managing my own schedule, choosing the music I work to and only having to negotiate with myself about when to take my next holiday. Oops, could it be I was the office lightweight! 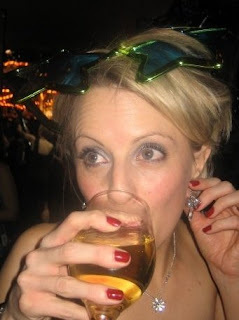 Christmas party season is about to kick off and that means one thing – lunches turn to liquid and the most reserved lawyer in your team suddenly reveals they are a complete liability after two glasses of wine. This means one thing – it’s time to start plotting how to escape your office lightweight. Mwa-ha-ha-ha. A booze-fuelled open and honest discussion with a partner that’s destined to put them at the bottom of the promotion pile. Drunken snogs with inappropriate colleagues under the mistletoe. And worst still, tearful heart-to-hearts on your shoulder. The office lightweight really knows how to put a dampener on a festive night out (and their career). Working from home - does it matter what you wear? What to wear to work is for many the first challenge of the day. For homeworkers it’s less of a priority as the only person likely to witness a sartorial disaster is the postman or an elderly neighbour. But should we apply a bit more thought to our working from home wardrobes? A telephone interview for an article I recently penned on dress down Friday made me question whether my work from home attire needed sprucing up. It was when this pro-office casual interviewee said to me something along the lines of, “I’m probably wearing something not that much different to you,” assuming I was wearing jeans and a t-shirt, that I had to stifle a giggle. I imagine as a senior level business professional, he wasn't wearing floral Primark pyjamas. Giggling suppressed, I started to feel anxiety rising, as I feared I may actually be asked to reveal what I was wearing that Friday morning. Using every ounce of my interviewing prowess, I guided the interview off this potentially shameful track. I didn’t have to confess or lie on this occasion, but it did make me think about what I wear to work. Does not having bothered to get out of my pyjamas to do a telephone interview show a lack of respect for the interviewee? Is slouching at my desk in joggers and a favourite hoodie a sign of a sloppy attitude? I hope not. But just in case, I will be making more effort with my working from home attire. And this is only partly an excuse for another shopping spree. Copyright theft, plagiarism – whatever you call it, I was recently a victim of a light-fingered online fraudster. Yes, a US scoundrel of a website was stealing the fine words from this very blog and publishing them as their own. This dishonourable operation neither asked my permission nor had the decency to attribute the pilfered posts to the AfternoonDebate blog or me personally. A resigned shrug of the shoulders and brushing it off as a peril of the digital age. Those who put up a fight. As a freelance journalist and copywriter, I make a living from the words I write, so someone stealing them makes me angry. Yes, I’m a number 2. Stealing copy is not only dishonest, it's also a legally dubious pursuit that you can get in a lot trouble for. So what did I do? I confronted the website owners and also made a legal complaint via Google about the site (it was a Blogger powered website). At the same time a fellow victim (the wonderful Evil HRLady) also threatened website takedown action via the DMCA (Digital MilleniumCopyright Act). The result: the website has been taken down and no longer has any content. Victory. Is someone stealing your praise? Plagiarism isn’t the only form of theft that can happen in the workplace (and we're not just referring to your stapler that's gone missing again). 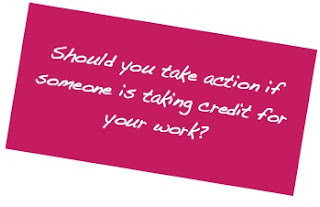 Every day unscrupulous managers and leaders take credit for their subordinates work - they steal your hard-earned praise. How do you feel when your boss beams with pride as someone slaps him or her firmly on the back for the work you’ve done? Do you shrug your shoulders or put up a fight? Special thanks to Evil HR Lady for spotting the thieving website and getting them taken down. 1. Most of my favourite films have Hugh Grant as the lead actor. 2. I am the person still watching Friends repeats on E4. So, if you’re looking for something gritty or gory, never, ever take a film recommendation from me. But Horrible Bosses is laugh out loud funny (and it was the whole of the cinema audience chuckling and guffawing not just me). It also got me thinking about horrible bosses in general. Now I’m not talking about mildly distasteful bosses (e.g. those with an unfortunate case of B.O. or an irritating donkey laugh), I’m talking about the ones that actually drive you to distraction with their downright horrid ways. A. No sexual harassment as dished out by Jennifer Aniston’s character (the thought makes me want to barf). B. No early morning alcohol traps set in the style of Kevin Spacey’s character (although an early morning drink may have made the days with this boss more bearable). C. No whores or cocaine involved. This boss was far too yawn-inducingly dull to have annoying qualities extending to the wreckless levels of the boss played by Colin Farrell. This boss, however, was the sort who made my daily life hell during the years I spent reluctantly under their rule and unearthed in me a penchant for bitchiness that I'm not usually fond of partaking in. A person who’s name that still years later I spit out with disgust. A bullyish, praise stealing, sycophant who attacked mine and the rest of the team's confidence and sanity. The type of boss who your friends and family (who have never met said boss) also hate because they are bored of you talking incessantly about how awful they are. Unfortunately, many of us have these bosses. With Horrible Bosses style murder plans out of the question, the tips I penned earlier this month in an article titled '10 ways to get through the week' may be of assistance. And go to see the film. You will laugh. Is it ever OK to pull a sickie? In a recent study by PwC a third of UK workers admit lying to avoid work. Skiving, taking a sickie, a duvet day – whatever you call it, most of us have done it (go on, admit it). Yes, despite my annoyingly ever-present guilt complex, I confess I have relented to the little devil on my shoulder and taken two fake sick days in my lifetime. The shame. I will share these two instances of shameful behaviour with you but that paranoid guilt complex of mine prevents me revealing the employers - I have an irrational fear that even years later they will hunt me down and deduct my pay. As I have a rather large sale shopping spree to pay for (including these bargain-tastic beauties from Coast) I’ll be keeping schtum. Number one: As an A level student I had a weekend job in a fashion retail outlet. With mountains of coursework to catch up on and the prospect of another dreary shift on fitting room duty dishing out well-meaning lies to customers with the worst possible taste in clothes looming, I decided to call in sick. With a quivering voice, I called in to deliver my well-rehearsed lie. A migraine. The truth was I had a slightly sore head (probably from the Barcardi Breezers consumed the night before) and wanted to catch up with the latest on T4 before getting stuck into some study. Number two: I was a recruitment consultant at the time. This was a short-lived career for me. I joined this ruthless occupation with the naïve idea that I would be helping people up the career ladder, guiding them towards the job of their dreams and helping them get that first job that they would recount fondly in years to come as their big break. My philanthropic beliefs about a career in recruitment consultancy in hindsight were hideous. Three months into the worst job I have ever had in my life, that pesky fake migraine hit again. With quivering voice again, I called in sick. I justify this sickie with the fact that I resigned about a week later. 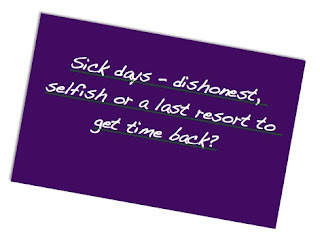 So, for everyone who’s taken a sickie - would you do it again? Some will say they are the downfall of the economy. Indeed, absence is a drain on businesses and the cause of more disillusionment in the ranks as the rest of the team has to pick up the pieces while the ‘sick’ employee settles down with Jeremy Kyle. Other downtrodden workers may suggest it’s their only way to reclaim the long hours and overtime that they have little hope of clawing back otherwise or getting compensated for. If you decide to let that little devil on your shoulder get his way, you’ll be interested to hear according to the PwC research respondents believed they could get away with pulling five 'sickies' before management would start getting suspicious. And remember never ever talk about it on Facebook or Twitter - we've all heard those horror stories. Squidged uncomfortably between piles of boxes on your left and abandoned surplus marketing brochures on your right, is it any wonder that you're feeling a little less than enthusiastic about going to work? Cramped, crowded spaces, dull greying walls and stark strip lighting. 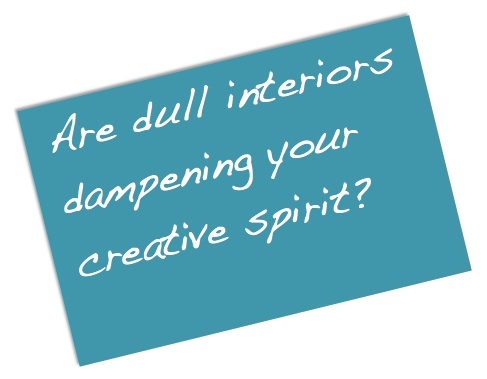 We've all got our own lacklustre experiences of working in environments that zap your creative energy. 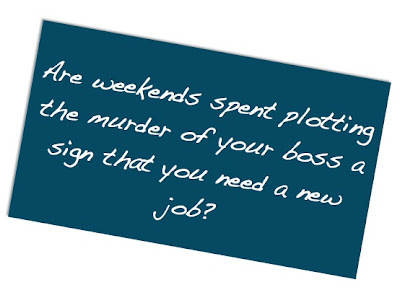 Dull office space creates downbeat employees that are little more than zombies. Making the interiors of workplaces interesting isn't purely about corporate vanity and branding, creating inspiring offices is really all about getting the most from your employees. So, what could you do to breath some life into where you work? After writing an article for Edge online about how to make your workspace more inspiring, I'm starting to think the creative hub that is Laura Jane Johnson Towers may need a complete overhaul. Or is it just an excuse to splurge on a new desk? For my office inspiration, I'm looking to the design duo behind Kancho Creative. Now there's an office I could thrive in! Watching a re-run of ‘The September Issue’, a documentary following Vogue’s Anna Wintour in the lead up to the publication of the (you guessed it) September issue, reminded me recently just how exciting September is. It may be a time when we bid farewell to lazy days in the sun, bottomless jugs of Pimms and fancy free summer holiday adventures but I still always get excited as I flip the calendar over into September. It always feels like a new beginning after the laid back lull of the summer. Everything wakes up again re-energised. Including the fashion industry. As the chill sets in I can’t wait to wrap up in a new season aviator (a must-have apparently and I’ve got my eager eyes on this one from Next) and clomp around in some new winter boots (loving these sock-lined clog boots from Topshop). But this blog is supposed to be about work and work issues, so any meandering off the subject to indulge my fashion interests should be kept to office friendly clobber. OK, back on track. The good news is the Autumn/Winter season trends seem particularly easy to translate into work wear this year. Minimalism. It’s a key theme in these austere times and is perfect for offices with dress codes that are firmly stuck in the dark ages. This collarless dress from Mango is perfect. But the key minimalist winter fashion item has to be the camel coat. The ultimate indulgence when it comes to covering up. And easy to slip over a suit. Coats like this military inspired one from Karen Millen or this cape from Pied a Terre just ooze a sense of classic elegance. The midi. Now when it comes to skirt lengths little old me prefers them above the knee. So, I need a bit of convincing when it comes to the new midi length. With a hemline hovering somewhere in the dangerously unflattering (in my opinion) territory between your knee and ankle, it's definitely channelling the respectable chic vibe that most offices prefer. I prefer to see them pencil tight though like this one from Oasis. The Mad Men craze. 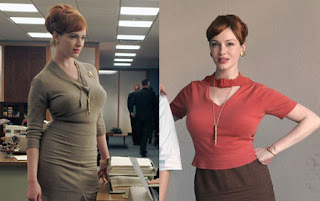 The next series is just about to hit our screens and everyone is talking about Christina Hendricks (who plays voluptuous office siren Joan Holloway). Curve complimenting dresses (like this one from L. K. Bennett) are destined to bring a bit of Mad Men's Manhattan sparkle (but hopefully less of the sexism, adultery, alcohol and tobacco abuse and scandal) to a grey Autumn day at work. And that's all from me. Happy September. And happy shopping. Who's starting the Afternoon Debate? As a freelance business journalist (specialising in leadership and careers) I have an instinctive curiosity about how the world of work is changing and how this affects our daily lives, lifestyles, ambitions and aspirations.